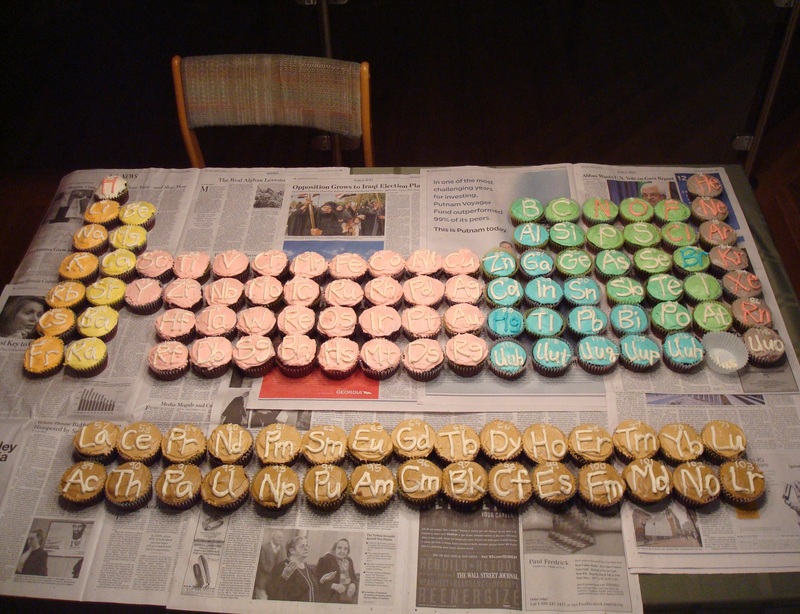 I helped my little sister bake these periodic table cupcakes for her birthday party tomorrow. She’s a chemistry nerd, so everything had to be exactly correct. Astute chem majors will notice the color-coded icing for solids, liquids, and gases, as well as the empty cupcake liner for as-yet-undiscovered element ununseptium. By the time the flour from the day’s baking had settled, we had emptied 2 bags of powdered sugar, 1 bag of brown sugar, 1 bag of white sugar, 16 eggs, and and 17 sticks of butter. Shoutouts to Ellie and Marissa for helping with the other metals, metalloids, and nonmetals, as well as to the best four elements on the table: Berkelium, Californium, Lawrencium, and Seaborgium. Oh, what? Stanfurdium? What? Oh, sorry, there isn’t one. Boom.